Colombia has seen two massacres in just two days – upping the pressure on the government to respond to violence against rural communities that allegedly has spiked since President Ivan Duque took office. A social leader and two of his family members were massacred in Caldas, a province in the coffee region that was spared much of the violence, national indigenous organization ONIC said Saturday. Community leader and musician Serafin Diaz, 63, his wife and their adult son were murdered after four hooded men reportedly stormed their home. Today again we are overwhelmed by sadness and anxiety in this territory that has made its best effort to overcome the mourning and heal the wounds of the armed conflict, which does not cease in our reservation. The daughter in the family – who were well known in the community – managed to escape and survive. According to Colombia’s National Indigenous Organization, Diaz was a renowned traditional musician and community leader, and they called on the authorities to find the killers and protect the indigenous people. His son was the community’s education coordinator. The Interior Ministry said on Twitter that Minister Nancy Patricia Gutierrez “rejects and regrets” the triple homicide. 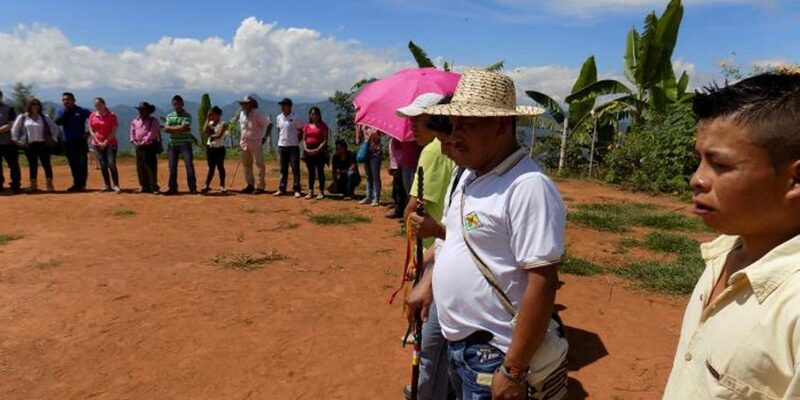 Four members of another family were butchered in their home in San Juan de Uraba, a town in the Uraba region of Antioquia on Wednesday. A 10-year-old boy, along with an 18-year-old, a 30-year-old woman and a man were beheaded, according to the country’s ombudsman’s office. It is unclear why the family were targeted, but the historically violent region of Uraba has long been disputed by paramilitary group AGC and guerrilla group ELN. The massacres put more pressure on Duque to go further to protect Colombia’s social leaders and activists, and reduce violence overall in the country. The president and his hard-right Democratic Center party have long opposed his country’s peace process that began on December 1, 2016 after former President Juan Manuel Santos signed peace with the FARC. According to conflict monitoring NGO Indepaz, 416 leaders have been assassinated between the beginning of the peace process on December 1, 2016 and Thursday. Since Duque took office in August, more than 62 leaders have been assassinated, according to the NGO.